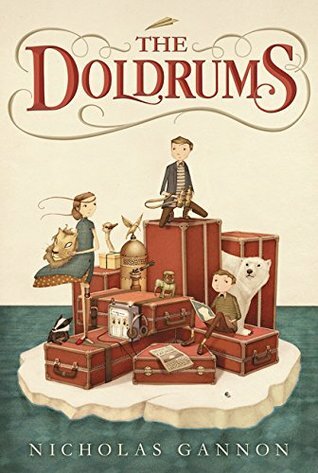 When I spotted The Doldrums on the shelf at work I knew it was going to be a new favourite. I love these “new classic” children’s books that come out every so often. It’s nice to know that kids are still interested in a fun adventure without all the violence that seems to permeate 9-12 books these days. Synopsis: Archer Helmsley has grown up in his grandparents home without ever meeting them in person. They have been traveling the world since he was born, and most recently, went missing on an iceberg when they jumped aboard to view some interesting penguins. His parents are the exact opposite of his adventurous grandparents, and his mother dreads that he is showing “tenancies”. Of course, she has every right to be wary, because Archer wants nothing more than to go on an adventure of his own. With a few new friends, and a bit of inspiration from some of his father’s old books, Archer just might be able to live up to the Helmsley name. This is a charming book with some wonderful characters and amazing illustrations. My absolute favourite moment is when Archer heads into the washroom to take a bath and puts an eye mask on the stuffed ostrich that resides there. His imagination is so great that he has complete conversations with the many taxidermied animals found throughout the house. That moment encapsulated the adorableness of this book for me. Archer’s friends, Adélaïde and Oliver, were both great characters. They weren’t just back-up characters to support his adventure. Adélaïde was on the run from her past and needed friends she could trust. Oliver was overly cautious and needed someone to show him how to be brave. Their own stories were just as interesting and surprising as Archer’s, and I think that any of them could have been the main character in this story. The book reminds me of Alex London’s ‘Accidental Adventures‘ series, and definitely has the potential to have more books follow. There are still some outstanding issues that need to be resolved in the book, which I think could mean at least one more.